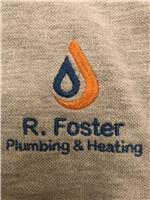 R. Foster Plumbing and Heating Ltd - Bathrooms, Central Heating Engineer, Plumber based in Kettering, Northamptonshire. I am a Kettering based engineer covering the whole of Northamptonshire and further afield. I have many years’ experience in plumbing and heating and cover installation, service and repair to central heating systems and designing & installing bathroom suites. Our company aims to cater for all jobs so whether it is a dripping tap or a new boiler you require we are on hand to provide you with a service that covers all these areas. We pride ourselves on providing a friendly, reliable professional service to all of our customers and we will go above and beyond to make sure expectations are always reached no matter how difficult the job. Pleaase contact us to discuss your requirements. Kettering based but covering the whole of Northamptonshire. New ideal logic 30kw boiler installed with 7 year parts and labour warranty. New central heating system fitted for customer in Kettering the house only had storage heaters before costing the customer a fortune in electric bills. This new energy efficient boiler will certainly keep their bills down and give them lots of warmth through the cold winter. I can’t stress enough to my customers to keep on top of gas servicing of all your gas appliances it’s very important and more importantly it’s about keeping you and your family’s safe. Full bathroom completed to customers chosen design this is one of my favourite bathrooms the tiles made it quirky just what the customer wanted. Fitted new ideal logic 30 combination boiler with a 7 year parts and labour warranty giving my customers the stress free of having to worry about the costs in the future.